Handcrafted gourmet brownies that are naturally free from gluten, dairy and refined sugar. Founder Leah loves baked goods, especially chocolate, but as a Type one Diabetic she always felt guilty about how much she indulged. 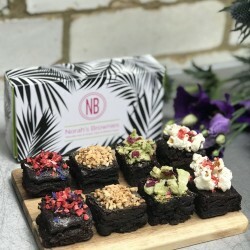 She started to look into alternative sugars, and as her husband was having to cut out gluten and lactose from his diet she challenged herself to create brownies that were free from refined sugar, dairy and gluten. After much experimentation with ingredients, ratios and timings, she has found what she thinks to be the perfect brownie, which is so indulgent you would never know it was free from anything. Leah has since developed an entire range with a variety of exciting and creative flavours and toppings. Delight in new flavours and discover a guilt free addiction. 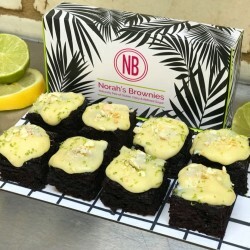 Norahs Brownies won a Great Taste Award at the The Guild of Fine Food's prestigious Great Taste Awards 2018, and have also been featured in Vogue.